SRWP threatens to boycott all American products - SABC News - Breaking news, special reports, world, business, sport coverage of all South African current events. Africa's news leader. The Social Revolutionary Workers Party (SRWP), Saftu and Numsa members have become a voice for Venezuela. The Social Revolutionary Worker’s Party (SRWP) has threatened to boycott all American products if the US fails to lift sanctions against Venezuela and allow the country to manage its own affairs. Venezuela has been in turmoil following the recent elections that saw Nicolas Majuro clinch his second term as president. In response, the US threw its lot in with the leader of the opposition Juan Guaido, who swore himself in as interim president. The SRWP, Saftu and Numsa members have become a voice for Venezuela. Certain media reports have described unrest and desperation in the South American country due to the political crisis. But the party representatives who visited the country disagree. While the US has pulled out its remaining diplomats from Venezuela, it remains set on the sitting president. Numsa has also praised the South African government’s vote against a US resolution to back Guaido. 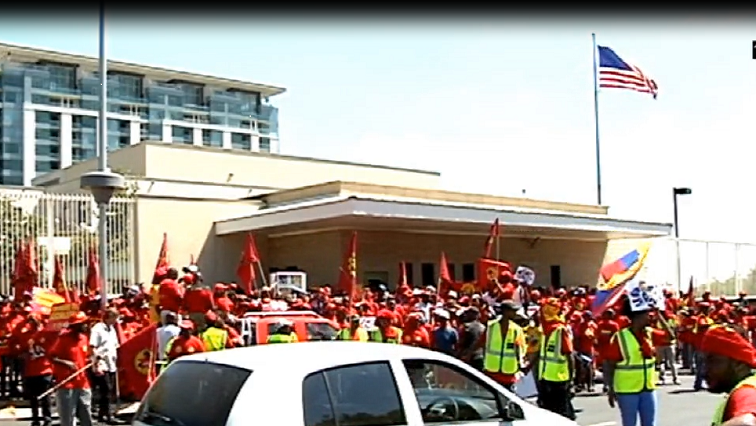 The unions and parties say they will return to Sandton in two weeks for a response. This entry was posted on 16 Mar 2019,06:53PM at 6:53 PM and is filed under Business, News, Homepage Latest Stories Slider. You can follow any responses to this entry through the RSS 2.0 feed. Both comments and pings are currently closed.